the next alarm of fire may be the last call for him." have died directly involved in emergency operations. Ceiling collapse at structure fire in single family dwelling. Explosion in electrical room of commercial building. Traumatic injury caused by single vehicle accident. Heart attack at brush fire. Pacific Bird and Supply Company. Died of smoke inhalation at arson fire. Cardiac arrest during rescue incident. Died of burns in roof collapse at arson fire. Died of burns from fall through roof. ladder pipe operations at arson fire. while avoiding collision with auto. on a crane collapsed during a fire. collapsed at a commercial structure fire. Died of suffocation in commercial structure fire. Fireman Thomas C. Collier, Jr.
Snorkel 3 overturned at fire. Cardiac arrest at house fire. Captain Clifford L. Collord, Jr.
of burns at structure fire. Inspector Robert L. Gillies, Jr.
of Oak Pass Road (High Ridge Drive) . on the Verdugo Fire Road. remaining at the panel of his pump to supply his crew. died at Central Receiving Hospital later that night with his wife at his bedside. at a grass fire in a vacant lot at 18557 Saticoy St.
when he collapsed and died of a heart attack. April 1 and died July 21.
turning from Pico Blvd. onto Valencia Street. Fall at factory fire on April 19.
rescue of civilian from pit. Died from injuries sustained attempting rescue of Fireman Kacl. near Sawtelle Blvd. and Westminster Ave.
St. Louis Street and 4th Street. an energized wire roof of a chicken coop. while laying a line at fire. Collision with Pacific Electric streetcar. Died of burns suffered June 2 at grass fire. pedestrians and crashed his buggy into a pole. died from his injuries four years later. Died of overexertion at greater alarm fire. Died of injuries sustained while responding to fire. One hundred and eighty members of the Los Angeles Fire Department died as the result of a duty related injury or illness. 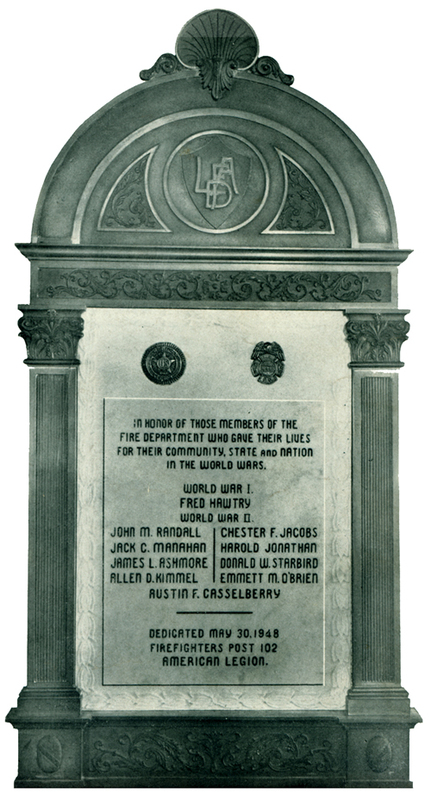 Auto Fireman William M. Enlow Jr.
Captain Harlon L. DeWitt Jr.
Fireman Eugene B. Dixon Jr.
Fireman Jesse E. Longwill Jr.
Firefighter Albert A. Bush Jr.
337 LAFD members served in the Armed Forces during WWII. NOTE: Research did not reveal how many members served in the Korean or Viet Nam Wars. This list may not be complete.